My studio is on Gulangyu, a vehicle–free island close to the metropolis, which is covered in architectural souvenirs from Xiamen’s days as a British treaty port. Every day, Gulangyu is visited by hundreds of brides and grooms in full wedding costume, there to take photos to display at their weddings. I often stand outside a grand, colonial-era church, watching brides as they are spat from makeup chairs down marbled steps to their photographers—an eerie, endless procession of white chiffon. While researching my album, I am interviewing people, trying to capture the city from different perspectives. My plan is to walk the streets, seeking subjects, following my instincts. But the signal is jammed with couples in love, frozen mid-kiss while life continues around them; assistants rushing in and out of frame, tossing veils that float upon the breeze. Online, China boasts versions of just about every major Western site: eBay, Facebook, YouTube, Spotify, as well as many, many more. Chinese Tinder is called Tantan, but if you walk around Gulangyu asking couples how they met, they will never cite it. Instead, they’ll tell you they met at work, or at school. A few will say that they were set up by a friend, or a relative—and in this, you hear echoes from another time, when marriages were arranged by a go-between. Having recalled the existence of matchmakers, those bustling scene-stealers of Chinese literature, I begged my translator, Iris, to get me an appointment. ‘It will be so funny,’ I promised her. Now we are squirming in our chairs, trying not to laugh and blow our cover, as the matchmaker asks me questions about my job, my parents, my hopes for a husband. My matchmaker works at Jiayuan, ostensibly a dating agency with a particular lean toward marriage that advertises itself as a matchmaking service. When Iris called, they told her that I would be meeting their top hongniang, meaning red maiden, a polite term for matchmaker derived from classical drama. But my matchmaker is not in red, and he is not a maiden. He leads me into a room so brightly lit I picture it ending relationships: fluorescent light revealing unseen blemishes. Romantic quotes line the screens around work cubicles, between stock photos of happy white people. A syrupy ballad plays over the speakers. Iris and I arrived with my friend Yifawn, who had some time to kill. I pretend that Yifawn is my aunt. He turns to her. ‘I can make my own decision,’ I say. He hands me the contract for a woman. There are several tiers of payment, each covering a period of six months. At 33, I’m in the second tier. It’s 39,999 yuan (around £4,500) for a man without property, and 49,999 for a man with property. There are no tiers for a person beyond the age of 50, though the 100,000 yuan Super VIP service is likely open to a woman of any age. I ask him why I’m more expensive than a 27-year-old. He looks apologetic. ‘Because you might not be able to conceive,’ he says. This is so funny, I think, anxiety flaring. For thousands of years, the matchmaker was the central figure in the Chinese system of arranged marriages. As early as the 4th century BC, the philosopher Mencius advised that marriage should arise from ‘a parent’s command and a matchmaker’s teachings’. In an arranged marriage, the couple would meet for the first time on their wedding day. One can only imagine the wedding night surprises that inspired sayings such as ‘Of ten matchmakers, nine are liars’; or ’A matchmaker’s mouth speaks misleading nonsense’. Still, without matchmakers greasing the wheels, choosing the wedding date, facilitating the exchange of gifts between families, and, on occasion, presenting the bride in the wedding chamber, marriage, reproduction, and the continuation of dynasties would have been nigh on impossible. The god of matchmakers, Yue Lao, lives in the moon, and ties couples together with red string. Back on Earth, the matchmaker has taken many guises. Throughout history, male and female matchmakers have worked alone, or in collaboration, arranging marriages and sometimes even overseeing ‘concubine markets’. My hongniang is named after a maid in the Yuan dynasty play The Story of the Western Chamber, while, in 17th-century Yangchow, a matchmaker was known as a ‘lean horse’. But it is the meipo (matchmaker granny) who dominates the imagination. She was the gossipy older woman who knew the secrets of every family, and brokered unions according to wealth and position. In theatre and film, she is grotesque, with powdered face, red cheeks and the large mole that is said to denote a smooth talker. She is also a source of slapstick—in Disney’s Mulan, she is doused in tea and attacked by a cricket, after drawing a beard on her own face. Despite her necessity, the meipo in literature is often sly, full of empty promises, with a mercenary’s eye on her profit. She is also a broker of illicit trysts, procuring prostitutes or arranging adultery in texts such as Pu Songling’s Strange Tales, and Lanling Xiaoxiao Sheng’s Jin Ping Mei, in which Grandma Wang also provides a pharmacopeia of plot-advancing poisons. Today, the role of the matchmaker, which officially ended in 1950 with the banning of arranged marriage, has evolved into new forms. In modern China, there have been stories of ‘auntie matchmakers’, freelancing women who act like private detectives for love, or ‘love hunters’, who scour the streets on behalf of wealthy clients. To date, the most ubiquitous rebrand comes in the shape of dating sites like Jiayuan, who have 180 branches across China, offering a straightforward online platform as well as their VIP service, counting 140 million users in 2015. As lifestyles and technologies accelerate, the ghost of the meipo lingers. Perhaps she rubs her hands with glee when a match is heralded on a phone screen, or when a contestant finds love on a dating show. Hovering invisibly around ‘matchmaking parks’, where parents paper noticeboards with details of their unwed offspring, she may feel satisfaction at the continuation of familial involvement, and, if she reads profiles of Jiayuan’s bachelors, indicating their business acumen and homeowner status, relief that the transactional nature of marriage is intact. If the meipo heard the story of Sister Feng, who became China’s most hated viral star after she handed out fliers on the streets of Shanghai, advertising for a husband—well, she might say this is what happens when you take matters into your own hands. Yet among all the dizzying advancements in Chinese life one might cause the meipo acute dismay. These days, there is another female archetype controlling the strings of marriage. Her name is the ‘leftover woman’. In China, a leftover woman (sheng nu), is an unmarried woman over 27. The term is widely used in the media and in advertising campaigns to spread ideology that pressures women into marriage in a society where men outnumber them by around 30 million. Leftover Women by Leta Hong Fincher, the definitive text on the phenomenon, cites 2007 as the year the All-China Women’s Federation, a state-funded agency, coined the term sheng nu. Soon, the ideology had been widely internalised, with many women across China rushing to marry, often against their own economic interests, to avoid the stigma of being alone. While I am in Xiamen, I hear a popular song by a singer called Zhao Lei, called Thirty-year-old Woman. In it, he sings: She’s a thirty-year-old unmarried woman, lines are beginning to show on her eyes… She’s alone, but a life with two people is happier. I was raised in the UK, a country where marriage rates are in decline, and where, as of 2014, the average age for a woman’s first marriage to a man is 34.6. Arriving in China, I viewed the idea of the leftover woman remotely. It had nothing to do with me, I thought. I found Zhao Lei’s song funny, and romanticised the idea of a woman who is ‘left over’ as evocative of outcasts in literature—branded women with unknown powers, as in The French Lieutenant’s Woman. After two weeks, I am beginning to feel differently. Like they say, it’s all fun and games until someone calls your womb old. Although I know that China’s marriage panic is often spread with the help of dating agencies (its most obvious beneficiaries), I can’t help but reflect on myself through the matchmaker’s gaze. No matter what I believe, I feel the pernicious fingers of an invisible force, trying to push me ever further along a spectrum, from ‘fresh with potential’ to ‘basically dead’. At the beginning of my trip, I thought that, if I lived in China, I would embrace my status as a single woman in her thirties easily. But I forget what an effort it can be to assert yourself, to break out of the prison of societal standards. If I lived here, would I be worn out by now? At the end of our meeting, I thank my matchmaker and say I’ll think about the VIP service. Out of interest, I add, what does he think my chances are? Glancing at my translator, he says the biggest challenge will be finding a man who can communicate with me. When I return to Gulangyu, the photo shoots are in full swing. I see couples posing with matching Starbucks cups, with twin sticks of barbecue chicken. I see brides waddling in oversized flip-flops between locations, their skirts bunched up in their arms like nets full of fish. I see a photographer’s assistant holding prosthetic bra-fillers under an umbrella, protecting them from melting in the heat. Iris and I decide to fit in some interviews. In the shaded area behind the church, an unofficial lunchroom, we ask another bride why she’s getting married. She’s pregnant, she says, pointing to a swell under her pearl-encrusted corset. She is so happy, it overcomes us. We walk back to the studio, grinning. China is so vast that no single strand of its culture can explain it fully. 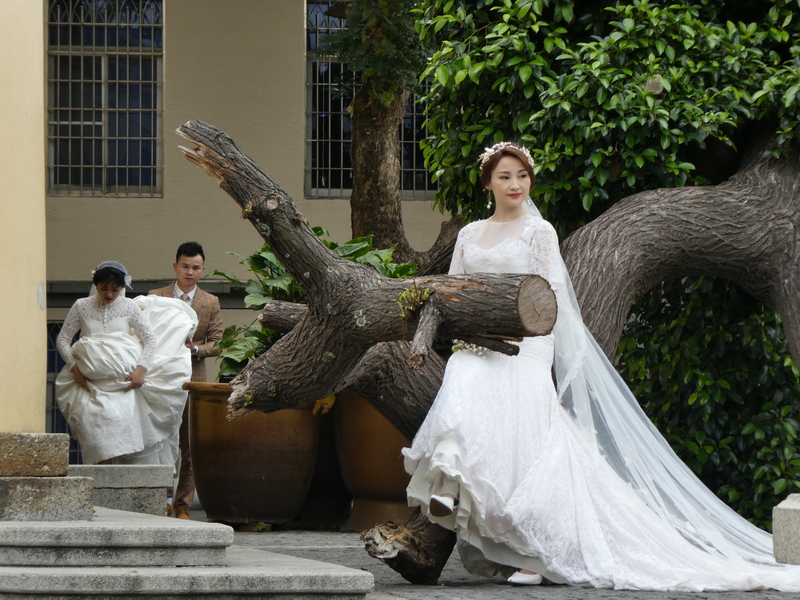 If some of the brides on Gulangyu are rushing to marry before society’s deadline, plenty of others are living out different romantic narratives. And in every case, there is the possibility of lasting happiness. But China’s women are also fighting back. In 2016, an ad campaign for the Japanese skincare brand SK-II tapped into a backlash, sharing videos of single women telling their stories under the hashtag #changedestiny. In the same year, Vice reported that a new reality show about leftover women in Shanghai was in production, called Eat Pray Escape. Stories circulate about women committing to single life, opting out of the culture completely, and, this being China, there’s always an opportunity for business. Want to avoid awkward conversations? Just rent a professional boyfriend for your next family dinner. Before I left, I saw a photo of myself, following the couples around with my camera. My clothes harsh black against the white figures beyond. My hair a mess. I looked like the outcast I’d imagined: stalking the island, peering through a lens at other people’s bliss. In that photo, I embody her, the woman alone, clinging to her work while others disappear into the soft focus of destiny. But it’s only a photograph—I am not a leftover woman. As, in reality, no one is. The Red Maiden features in Somesuch Stories #3, which is available for online purchase worldwide.